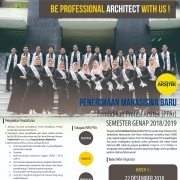 The establishment of professional program (PPAR) in the department of architecture UII is stated in the Strategic Plan of UII (University Renstra) year 2014-2018 in correlation with the re-design of university, faculty, and department organization of UII. The establishment plan then elaborated in detail in the faculty of civil engineering and planning’s strategic plan. The aim of the establishment of the professional program is intended to meet the needs of the professional architect in Indonesia and ASEAN market especially after the agreement of ASEAN Economic Community/AEC in 2015. In addition, the global environment and community has led Indonesia to sign the standardization and synchronization of the educational system, especially in the field of architecture. Some agreements ratified by the Indonesian Government such as AFTA 2000, APEC 2010, and WTO 2020 have required the improvement of the workforce education in order to compete in the international level. 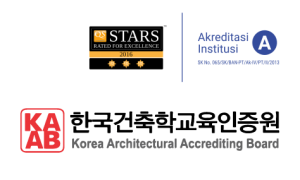 In 2008 Indonesia signed the ASEAN Mutual Recognition Arrangement on Architectural Services (ASEAN-MRA) to recognize the qualification to become an ASEAN Architect (AA). The implication of MRA is the requirement qualification of ASEAN Architect in line with the international standards including the qualification of school of architecture to comply with the international standards (5 years program). Union International of Architects (UIA) is an agency under UNESCO-United Nations responsible and competent in giving the recognition to the architect and accreditation/validation/international recognition of equality for the school of architecture internationally. The MRA for ASEAN Architect also refers to standards of education and competence of architects by the UIA. In this case, so far the architectural education system in Indonesia which only within 4 years duration does not meets the UIA requirement (5 years program). Hence, the professional program of architecture in the department of architecture UII with 4+1 year scheme is established to give the opportunity for the architecture graduates in Indonesia to be equal with their counterpart in ASEAN and international level. In order to achieve the mission and objectives of the architecture professional program several efforts is accomplished. First, the effective and efficient management with the support of good governance, synergy, and integration in the department, faculty, and university level is implemented in the program. Second, capitalize all aspects of supporters including partnership, adequate infrastructure, funding, curriculum, academia (faculty members and adjunct professors), students, and administrative staffs. Third, design and implement educational curriculum based on competency (Competence-based Curriculum) and learning methods based on supervised studio by professional architects supported by good infrastructure of ICT (Information and Communication Technology) as medium of learning as well as ICT as expertise to support the andragogy competence of the graduates. Fourth, having clear financial revenue projections including the calculation of investment, investment source, the annual projection of operational expenses and tuition fees considered to implement the program. The professional program (PPAR) opened since the academic year of 2012/2013. To date there have been four batches with 25 total graduates recorded in 2014/2015. Of the total number of the graduates, 60% have awarded as Arsitek Muda IAI. The number of PPAR student’s increases from time to time and it is expected to continue increased along with the current enactment of PPAR graduates will automatically awarded as Arsitek Muda IAI upon their completion. Architecture Professional Practice is a four credit of compulsory subject taken by the student in semester 5. The learning objective of the subject is that the student understand and aware of the architecture professional practice especially related to particular aspects, as follows: working relationship of the between architect and client (individual, private and public enterprises, or government) as written in IAI standards, understand the various form of design assignment, stages of the design process, architect standard works (AIA, IAI, Ministry of Public Works), the implementation of the design process (project operation), organization and working procedures team, construction document standard, bidding, and negotiation process. Apart from the professional practice, professional ethics is a two credit of compulsory subject which must be taken in semester 1 of PPAR (year 5). This subject is a collaborative subject managed by lecturers in the department and training strata 1 and strata 2 as well as the code of professional conduct that are managed by IAI. Code of conduct of the architectural profession, building code in Indonesia, architectural accreditation system as well as registration to accreditation of Indonesian Institutes of Architect (IAI), and other related regulations are amongst the material of this subject. It is expected that through Professional Ethics subject will educate the students on professional ethics and understanding their responsibility as professionals and as architect for the whole society including for the marginalized groups. The information regarding the qualification to practice, registration, and accreditation to the students is embedded in the subject of Professional Ethics and Professional Practices. Moreover, occasionally lecturers of other subjects also provide information regarding this matter, such as in the design studio subjects. Hence, it is expected that the students will have a more comprehensive understanding regarding the significance of architectural accreditation and registration process. Together with other information such as the importance of professional education in architecture the information of professional accreditation and registration is given to the student as early as semester 1, especially in the first meeting of new students and the head of department and other lecturers. The information of professional accreditation and IAI registration system is specifically mentioned at any period of graduation (6 times a year/every 2 months) to the graduates of 4 year program (S.Ars) as the target for the professional program and prospective member of IAI. The information regarding the professional program (PPAR) is also conducted to the working partners of PPAR (architectural firms) twice a year at the beginning of each semester. Information to other institutions and collegiate/academia of architecture in Indonesia is continuously interwoven, for instance through IAI (for the last five years the chairman of IAI is held by one of the faculty member of Architecture UII: Ir. Munichy B. Edress, M.Arch) and through Indonesian Association of School of Architecture (APTARI), as the former head of department of architecture UII is the chairman of Academic and Knowledge APTARI (Dr.-Ing. Ilya Fajar Maharika, IAI). Through academia and professional forums in Indonesia, the information especially regarding PPAR-UII is conducted, bred, and developed, as it has been acknowledged that the department of architecture UII plays a leading role in the national level.